Welcome to the Shonen-ji Temple web site! Having a "web presence" is very new to us, and we will be adding more information here as we learn more about this wonderful technology. Please explore our pages and come back again soon to see what we have added since your last visit. Thank you! · December 12, 2011: The About Us page now includes a Google map of our location. · February 11, 2012: Victoria's Page has been replaced by "Victoria's Blog". New articles (posts) will now appear above earlier ones. Please use the Add Comments feature under any post to send us your thoughts about it or about our web site in general. Thank you! 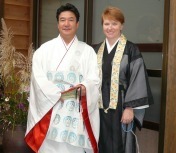 · April 20, 2012: The Temple History page now includes a link to an article written by Junsho-san on the origins of our temple. At present this article is available only in Japanese.